The Universal Access Vertical Press Outdoor Fitness Station welcomes people of all ages, skill levels and abilities to engage in upper body strengthening exercise. The dual user design stimualtes socialization and fosters inclusion—all while promoting healthy lifestyles. Designed specifically for inclusion this station maximize accessibility, ease of use and independence. One side of this outdoor fitness station features unfettered mobility access, allowing the user to perform the exercise without having to transfer to a seat. Both sides feature ergonomic handles and isokinetic spring resistance technology. Engineered for the outdoors with durable powder-coated steel construction with a modern style that is ready to enhance the landscape. 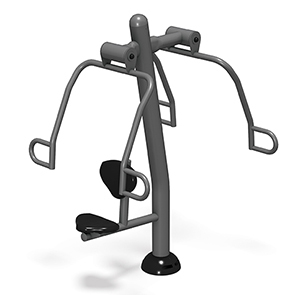 This Universal Access Vertical Press Station is a low impact, innovative piece of outdoor fitness equipment, designed to be user friendly and help improve the physical health of the community. Strengthens chest, shoulders, upper and mid abs, forearms, and triceps. Improves the ability to lift and push.